This T-26S Model 1939 was part of the Russian force that occupied Persia in 1941 and is inspected by allied British soldiers. Like many other Russian tanks in the early thirties of the last century, also the T-26 was developed from a British model, which had been bought by Vickers-Armstrong. In this case, it was the 6-t-tank with two turrets, which formed the initial model. The Russians developed from it a light infantry support tank to replace the obsolete MS. It was produced during the entire period of 1931-1940 in large series. Overall, more than 12,000 units were produced in a variety of models. In 1930 a team of engineers of the test department (OKMO) of the Bolshevik works in Leningrad, which was headed by N W Barikow and S A Ginzbury, built 20 pre-production vehicles with the label TMM-1 and TMM-2. In a comparison test against Russian models (T-19 and T-20) they had been approved by the Revolutionary Defence Council of the Red Army on February 13, 1931. After minor changes by the engineer Sigelja it was ready for production as the T-26. Apart from a few small changes in shape at the front of the hull and on the two independent machine-gun turrets, the production vehicle corresponded completely to the British original. This T-26 Model 1933 served with Franco’s forces in Spain, after it was captured from the Republicans. The T-26 Model 1933 during a parade in Turkey. 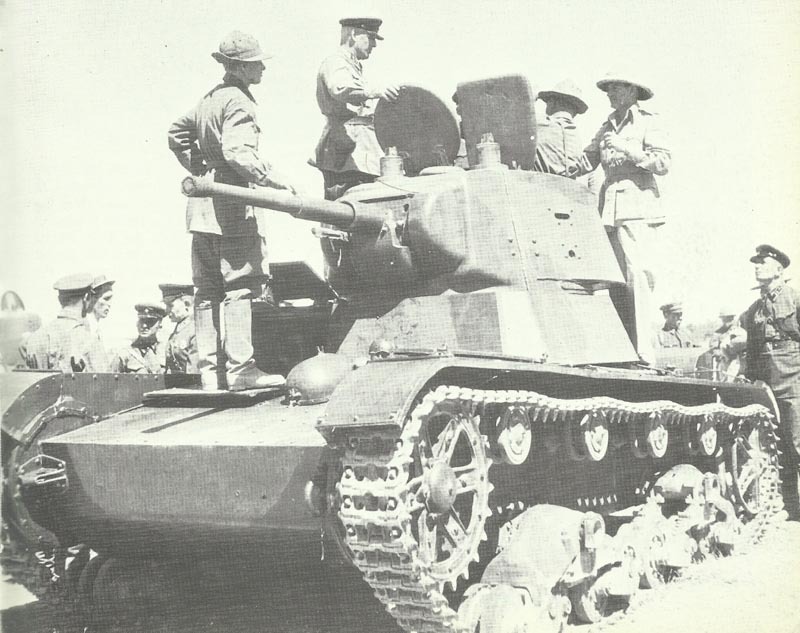 During the 1938 fightings in Manchuria a T-26B moves forward against Japanese positions. This T-26S Model 1937 was abandoned in a bog during the summer fightings of 1941. T-26 Model 1931, Model 1933 and OT-26 flame-thrower versions on the 1935 May Day Parade in Leningrad. Captured T-26 in use by German troops, which called this model T-26C 740(r). 3D model T-26B as used in the Spanish civil war. In the following year, the mass production in different plants was started , including the Kirov factory in Leningrad. In the first series the turrets lay side by side and could be equipped with a variety of weapons. The command tank T-26TU was equipped with radios. The antenna was a railing around the turret. It was intended to make a model with only one turret fo the army, which was equipped with a new long-barrel 37 mm gun. However, from this model only a small series was built, because it was decided to use a single turret model with a larger turret. The mass production of this model was started in 1933. The first vehicles were armed with the new 37-mm gun, but later got the tank a newly constructed 45-mm gun. In 1938 the Far East army reported, that the riveted T-26’s were no match for the Japanese fire power. Therefore, a new welded version, the T-26S, was designed. Some older versions of the T-26 received this turret also. Before the Russian campaign in 1941 the T-26 has already been used against the Japanese in Manchuria, in Spain and in the Russo-Finnish War. During his service in the Russian army the T-26 has been changed on several occasions and also formed the basis of many specialist vehicles. Among them, for example, self-propelled guns, flame thrower tank, armored vehicle launched bridges, nebulization tanks, artillery tractors, remote-controlled explosive tanks and many others. User: Russia, Spain, China, Turkey (captured specimens were used also by the Finnish, German, Romanian and Hungarian armies). Details unknown 12-37 mm ? before 1940 ? c.10,500 ? 1941 c.11,000 (June) (only some special versions) ? 1945 (out of service end 1945) – ? Tagged 1939, light tank, russia.